Han Seo-hee, the controversial K-pop trainee who came to public attention in 2017 after being found that she had smoked marijuana with Big Bang’s T.O.P at his apartment, uploaded a lengthy Instagram post Wednesday night, implying she had undisclosed dirt on T.O.P and YG Entertainment. T.O.P, who had been serving as a conscripted policeman when he failed a drug test, has since been removed to serve alternative duty at a cultural center in Itaewon, Seoul. Meanwhile, Han was sentenced to three years in prison, suspended for four years. Han has amassed a reputation for blasting online attackers, men and transgender women during live broadcasts on social media, sometimes with vulgar language. Her latest take to Instagram doesn’t let up in tone, but was also loaded with implied accusations toward someone she doesn’t specifically name. “Why don’t you actually give some money? You have a lot to spare. I was going to let it pass because it seemed you were living quietly at least. But you had thick skin to restart Instagram uploading so I’ll say what I must say,” Han wrote. 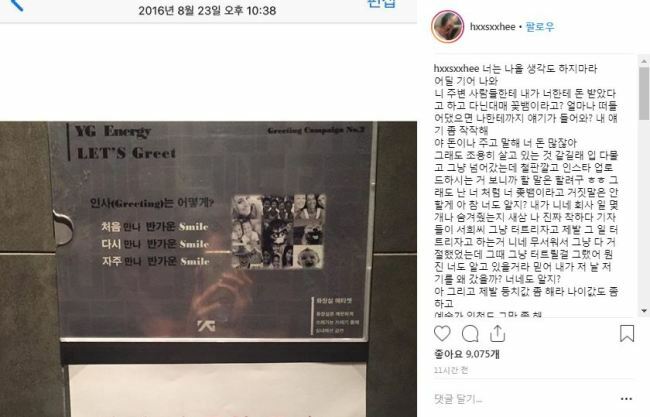 Han’s words were paired with a photo taken inside YG Entertainment building’s washroom. 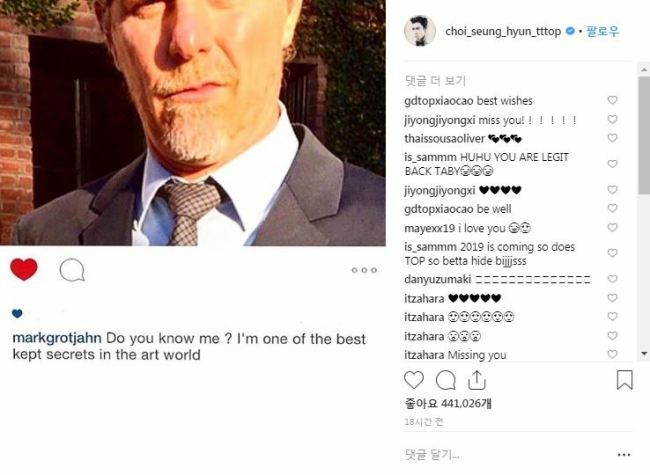 Entertainment industry watchers are leaning toward the interpretation that Han was targeting T.O.P, who had updated his Instagram for the first time in almost a year on Wednesday, with photos of American abstract painter Mark Grotjahn.